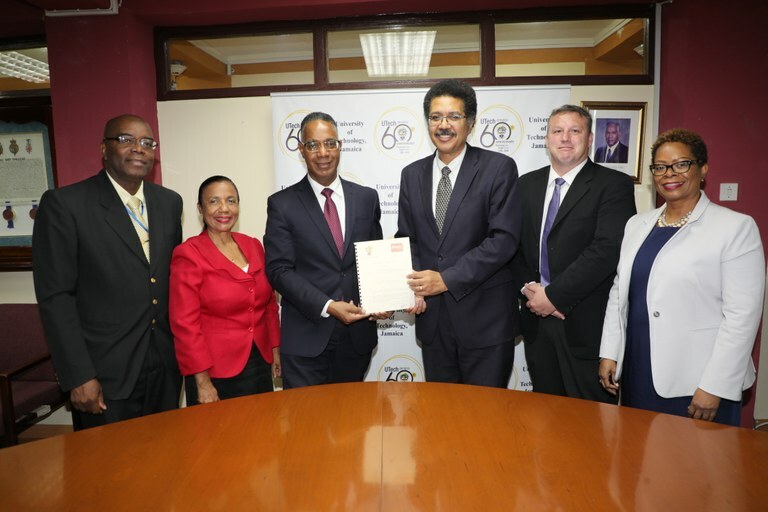 UTech, Jamaica and Brock University Sign MoU to enhance Scholarship and Research — UTech, Ja. Professor Stephen Vasciannie, (1st right) President, University of Technology, Jamaica and Dr. Gervan Fearon, (3rd left) President, Brock University, Canada display a copy of the Memorandum of Understanding between the two universities signed at the UTech, Jamaica Papine Campus on Monday, May 21, 2018. Participating in the occasion (from left) are Mr. Paul Brissett, Chief Business and Finance Officer, Mrs. Mercedes Deane, University Registrar, Dr. James Mandigo, Vice –Provost and Professor of Strategic Enrolment and International, Brock University, and Dr. Claire Sutherland, Senior Director, Office of International and Institutional Linkages, UTech, Jamaica. The University of Technology, Jamaica and Brock University, Canada, on Monday, May 21, 2018 signed a Memorandum of Understanding (MoU), formalising the intention of both institutions to collaborate for mutual benefit in advancing scholarship and research. The MoU was signed by President, UTech, Jamaica, Professor Stephen Vasciannie and Brock University President, Dr. Gervan Fearon at the UTech, Jamaica Papine Campus. In welcoming the collaboration, President Vasciannie noted that “the value of international cooperation in higher education cannot be overstated.” He thanked Brock University for choosing UTech, Jamaica to host discussions to explore further opportunities for student and faculty exchanges and scholarship between both universities. “This will no doubt open many doors to international post-secondary and terminal degree studies for persons who would perhaps not have otherwise had the opportunity,” the President noted. Under the MoU agreement, UTech, Jamaica and Brock University will collaborate in areas such as articulation of accredited programmes, student and faculty exchange and internships, collaborative research projects, staff development and training, public education initiatives, such as public lectures and seminars, and joint publications. Dr. Gervan Fearon who was accompanied by Dr. James Mandigo, Vice–Provost and Professor of Strategic Enrolment and International at Brock University were visiting Jamaica as part of their university’s Caribbean tour to promote its Caribbean International Scholarship programme. Dr. Gervan reported that Brock University as part of its strategic direction is looking to the Caribbean region to establish relationships with institutions, in support of growing its international student population beyond the current 10% . Dr. James Mandigo in providing advice on access to the Brock University Scholars Programme noted that faculty members, staff or graduate students can arrange to visit Brock to participate in the university’s Guest Scholar Programme. “That might be the first step for someone who is interested to pursue a PhD, to come for a few weeks and meet with some of our faculty members, identify a supervisor, and then that should strengthen their formal application to do their PhD,” he recommended. The MoU agreement was facilitated by the Office of International and Institutional Linkages, led by Dr. Claire Sutherland, Senior Director. Dr. Sutherland notes that UTech, Jamaica has had extensive partnerships with higher education institutions in Canada, over the years, with both our students and members of faculty benefitting. Most recently ten undergraduate students and academic staff were selected for the Emerging Leaders in the Americas Programme (ELAP) and the Canada/CARICOM Faculty Leadership Programme (CCFLP), funded by the Government of Canada, for the Academic Year 2017/18. The ten awards are tenable at five Canadian post-secondary institutions: Brandon University, University of Prince Edward Island, Humber College Institute of Technology and Advanced Learning, Ryerson University, and University of Waterloo.